When we moved to this home in the spring, there was a tiny burn pile. More of an ash circle, really. Over the summer it’s grown as we’ve trimmed and cleaned up bushes and shrubs and vines. 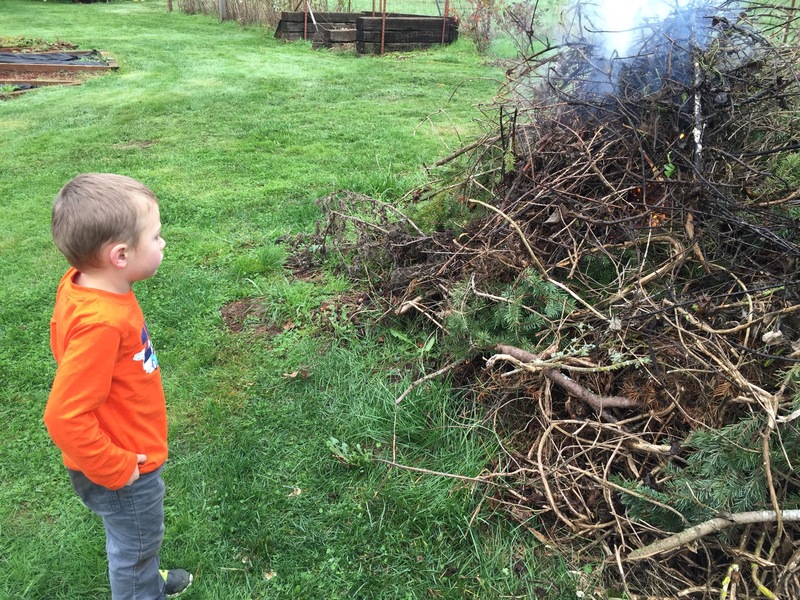 Niko has been fascinated with the idea of a burn pile. A pile made just for burning! He’s asked me nearly every week, “Will we light the burn pile soon?” Of course, the start of burn season coincided with the start of autumn rain, and we haven’t had a good weekend for it. Today was the first time it’s been not raining while Aaron has been free to manage the burning. Niko was fascinated with the flames! However, it turns out that a day so humid that you accumulate water droplets on your clothes and hair is not conducive to burning. It flamed long enough for Niko to get excited, then damped down again.